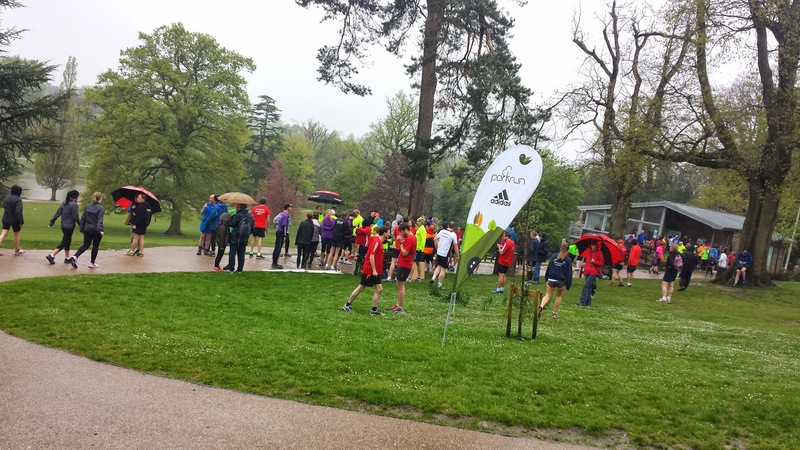 On Saturday 26 April 2014, Royal Tunbridge Wells parkrun became the tenth parkrun in Kent. I managed to plan my #7weeksofparkrun challenge so that my second 'r' would coincide with the inaugural event as I really didn't want to miss it. 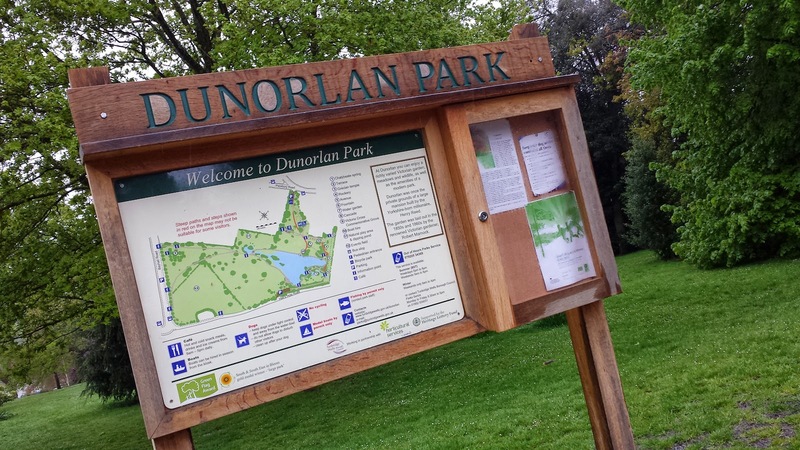 The run takes place in Dunorlan Park, which covers 78 acres and is located just to the east of Royal Tunbridge Wells, straddling the boundary between the town and the surrounding countryside. It used to be the grounds of Dunorlan Mansion which was built in 1862. The mansion survived until 1958 when it was demolished and the land used to build 8 new houses. 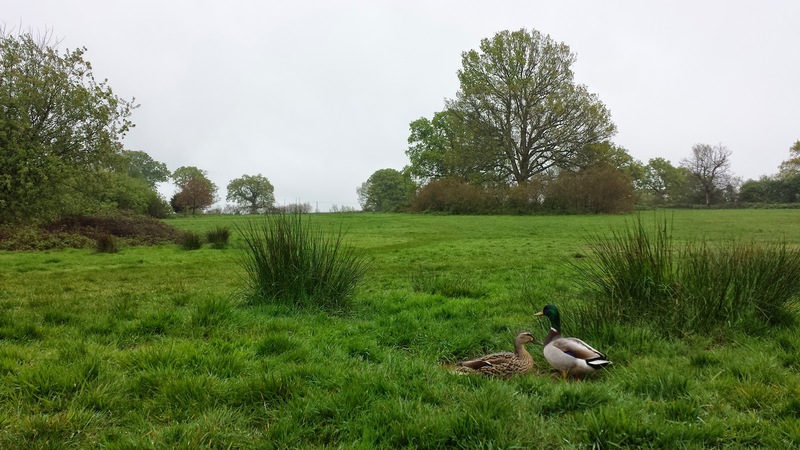 30 acres of the park were opened to the public in 1946 and it wasn't until 1996 that the remaining land, until then used for grazing and not open to the public, was incorporated into the park. The tea pavillion, which is the meeting point and the post-run social venue, has been in operation since 1966. The toilets are fairly close by. 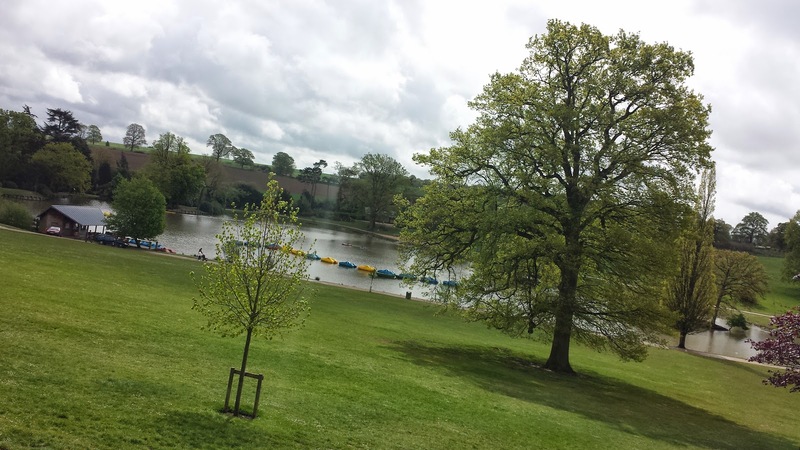 The train station in Tunbridge Wells is not too far away from the park, but leave enough time to walk/jog the 2 kilometres you'll need to cover in order to reach the start line. Drivers can head to the park and use the limited free parking that is on offer using either Pembury Road or Hall's Hole Road entrances. If those are full there is further limited parking on Bayhall Road. If that fails, then you'll be looking at one of the car parks in the town centre. According to the map of the park, there is some cycling parking in the Pembury Road car park - I didn't manage to spot it so I can't tell you how many racks are provided. This is an anti-clockwise, two-lap course which you could also describe as a figure-of-eight course. It starts on the path just outside the cafe on well maintained paths. However, the surface underfoot on this course does not remain on these paths, so you may find that in wet conditions trail shoes may be required - and that's what I went for on the day I visited. Once the run briefing is over and the timers are ready, the run is started. The runners first head down a steep path towards the lake (I would say to be cautious at this point as one falling runner could cause a pile up of runners). At the bottom there is a boathouse (boating has been in operation since 1949) and the runners simply follow the path around its natural right-hand curve. 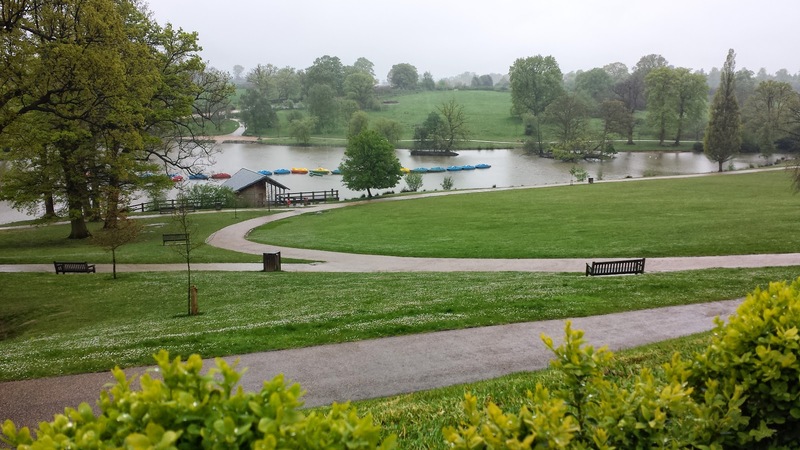 The runners then run adjacent to the lake which covers 6 acres and is an impressive feature in this very well presented and elegant section of the park. 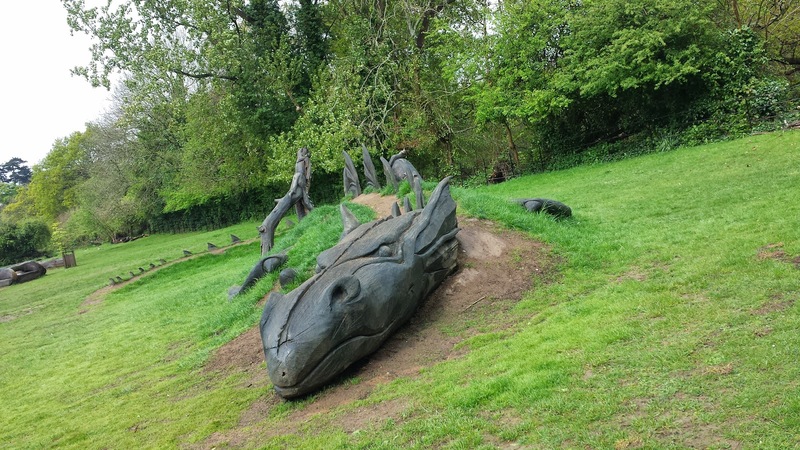 Towards the end of the lake, if the runners glance to their right they might just catch a glimpse of Dunorlan the Dragon. Once at the end of the path, the course goes across a wooden bridge then the runners take a right hand turn and the surface underfoot changes. At present, this next section's path has suffered severely from the very wet winter and a long crack/ridge has formed along it. I'm sure the park authorities will repair this in due course, but in the meantime you'll just have to watch your step. The course gently rises along this section before turning left and leaving the man-made paths behind for a while. 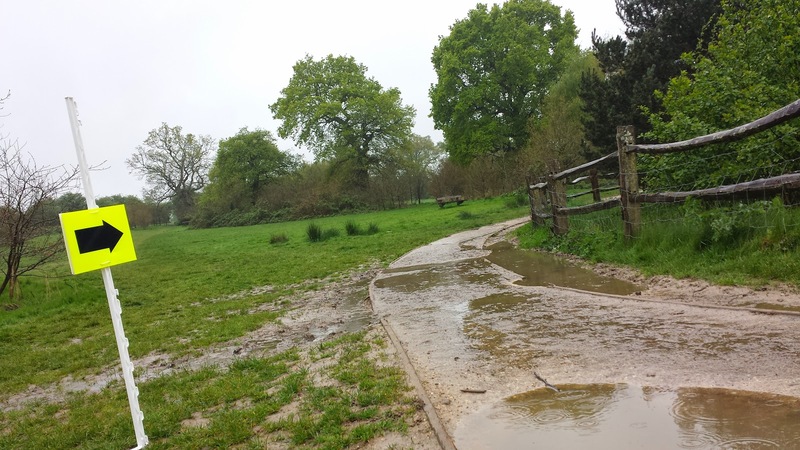 The main feature/hazard/obstacle of the first part of the off-road (off-path) section is a big dip in the ground, a bit rollercoaster-ish but on a very small scale, the path here was quite rutted and splashy when I ran here so it's another place to be cautious. 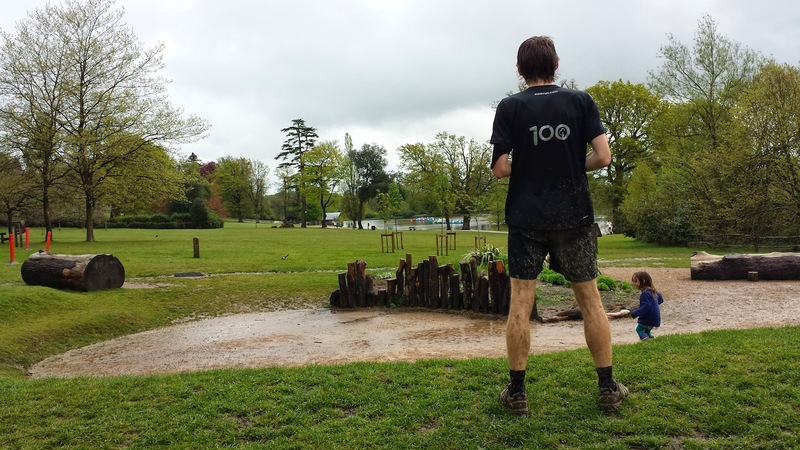 After this the runners enter the event field and run around about three-quarters of the perimetre before exiting the field and can then enjoy a slight downhill stretch on grass and dirt paths, which lead the runners back onto the well maintained paths. Runners now run along the other side of the lake and the path has a meandering or slightly twisty-turny feel. 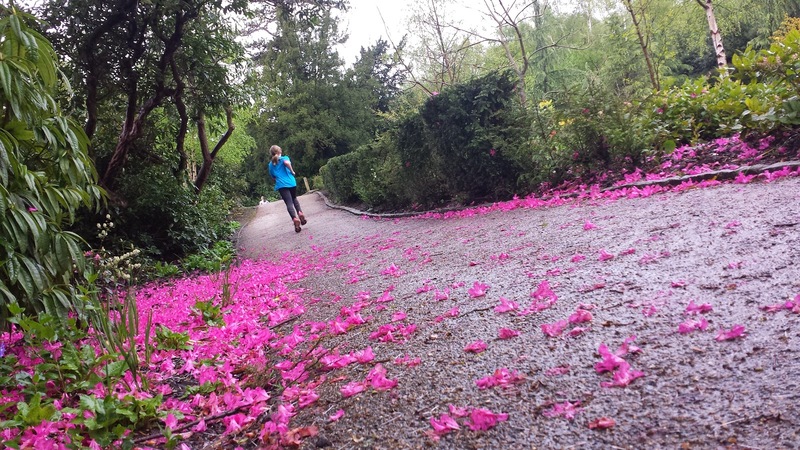 Once reaching the east end of the lake, the runners are directed onto a lovely straight section with all kinds of well-presented plants, shrubs and flowers on each side. 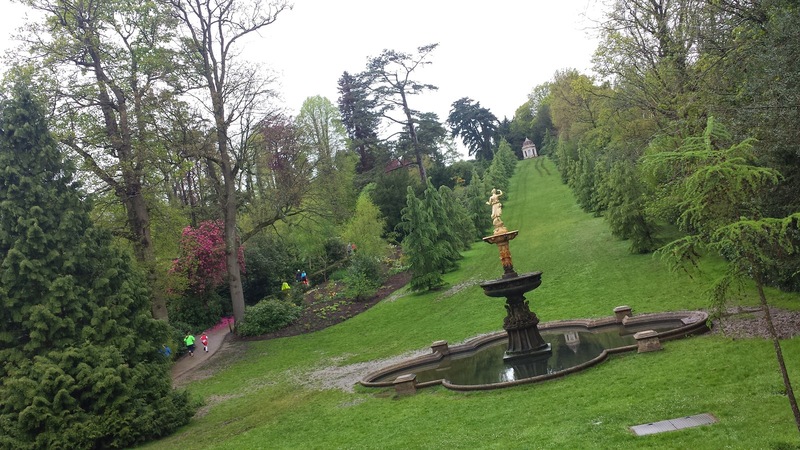 Next, the runners turn left and can see one of the main features of the park - the fountain, which sits at the bottom of the tree lined avenue which has another feature, the Grecian Temple, at its far end. The temple used to house a statue 'the dancing girl', but this was stolen in 2006. Exactly how it was removed and its current whereabouts are still a mystery. From here, the runners make their way back in the general direction of the start area, which means that it is uphill. It's worth noting that the original terrace from Dunorlan mansion still exists and offers great views of the park is just to the runner's right as they climb the hill. But as they are gasping for breath on the hill they really won't be interested in that or indeed the Chalybeate Spring or the 350 year old Yew tree which are also both close by. At the end of lap one the runners only have to climb part the way up before heading back down the steep path towards the lake, but on lap two you go all the way up, and it is a tough end to a really lovely parkrun course. The funny thing is that it doesn't look that steep in the photos. The finish funnel is almost in the exact same place as the start, right next to the cafe, which is where you'll probably want to head to find a drink and a seat - that is if you can pick yourself up off the grass after running that final incline. 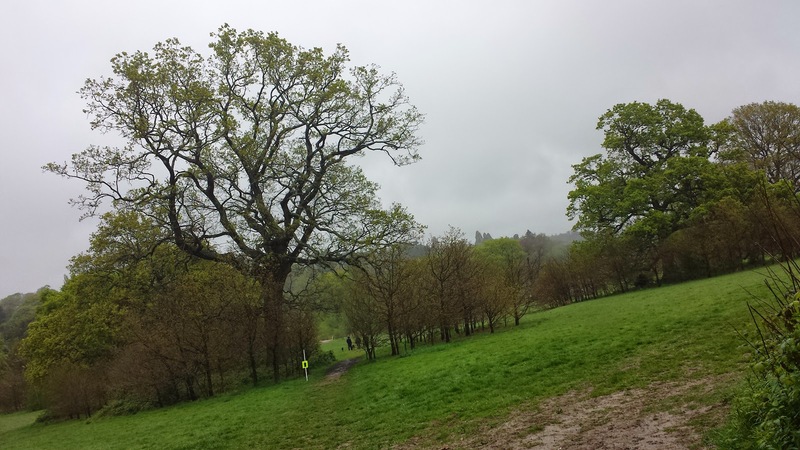 A few days before the inaugural event, there was a news article posted saying that the course is unsuitable for buggy runners. Looking around the course, the areas of concern seem to be the section where the path has cracked and also the little rollercoaster-style dip. If, like me, you have experience running with a buggy off-road and have an appropriate buggy then these might not present too much of an issue. 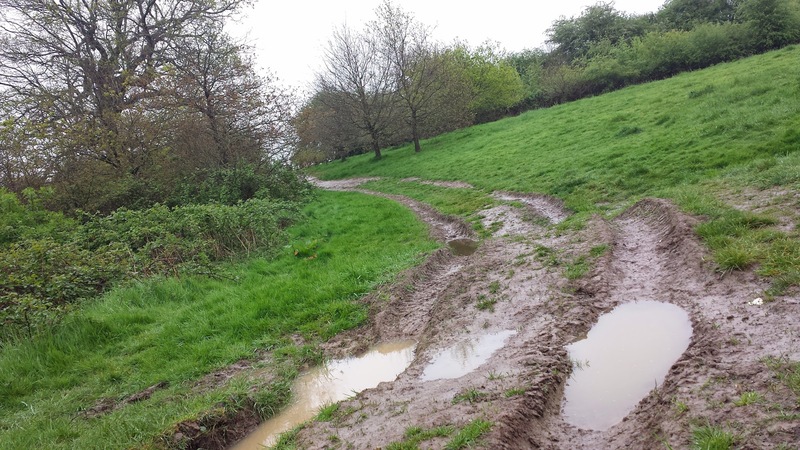 If you are considering buggy running here, it might be worth having a chat to the event team beforehand for their latest advice, just incase things improve. I found the course to be very nice to run but I really did suffer on the second lap, I think the uphill at the end of lap 1, then the steep downhill, coupled with the gradual incline and the grass section which both felt a lot harder on lap two really knocked me for six. But somehow I managed to put in a decent last kilometre and still managed to finish under 20 minutes (official results page for event 1), which made sure that I ticked all of the boxes for my #7weeksofparkrun challenge (my second 'r' / fifth county / fifth sub-20 / fifth consecutive week). 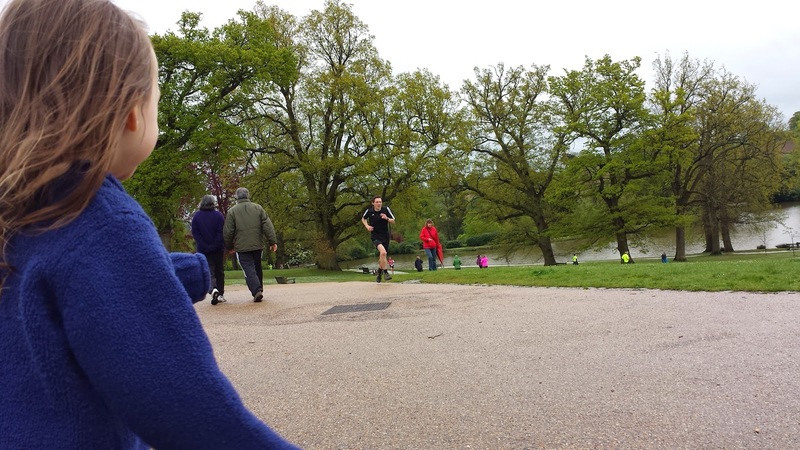 The parkrun show - episode 138 - Dannis Mangle.